Here are some common questions that you may ask about K2 blackpoint. Q: We already have blackpearl does blackpoint fit into the picture? A: All the functionality in blackpoint will be rolled into blackpearl. Blackpoint is targeted toward organizations that want workflow beyond what SharePoint workflow can provide but may not need all the capabilities, such as Visual Studio and SmartObjects that blackpearl includes. Q: Can I use blackpoint with WSS, Microsoft Forms Server and MOSS? A: K2 blackpoint can be used with either Windows SharePoint Services v3 or Microsoft Office SharePoint Server. Microsoft Office Forms Server to provided for web-enabled InfoPath forms. Q: Can I use SharePoint 2003? A: SharePoint 2003 is not supported. Q: Can I use blackpoint on a load balanced SharePoint farm? A: Yes, K2 blackpoint can be used to provide workflow capabilities for any number of SharePoint web front-ends in a SharePoint farm. Q: What servers in my SharePoint farm do I have to install this on? A: The K2 blackpoint server components can be installed on a non-SharePoint server or on any of the SharePoint servers depending on how the farm is being scaled. On each SharePoint server, a set of web services is installed to facilitate communication between the SharePoint server and the K2 blackpoint server. Q: Will I need administrative rights to install? A: Yes, the install requires a user with local administrator rights on the server. Q: Will this install anything on my SharePoint central administration site? A: Yes, the K2 blackpoint install adds a tab to the Central administration site that provides access to administrative pages and tasks for managing the integration between K2 and SharePoint. Q: Do you do solution or feature deployment? A: Components such as our K2 web parts are deployed via solution deployment. Other components, such as our SmartObject creation capability are deployed as features and can be activated on a per site collection basis. K2 blackpoint processes are deployed to the K2 blackpoint server and do not reside directly on the SharePoint server. Q: Can I extend the templates in K2 Studio? A: No, existing templates in K2 Studio cannot be extended, but custom templates can be built and surfaced within the K2 Studio environment. Q: Can I get to the code in K2 Studio? A: No, code-level access is not available in K2 Studio. Q: Do I have to use a process portal to manage my process? Q: Microsoft says SharePoint has workflow, what does this do that it does not? A: K2 blackpoint extends on the out-of-the-box SharePoint workflow capabilities by including a drag-and-drop Office-style process designer, functionality to manage all aspects of your SharePoint environment including lists, libraries and sites, a more in-depth set of reporting capabilities and improved task management capabilities such as delegation and redirection. Q: Why wouldn't I just want to use built-in workflow in SharePoint? A: SharePoint workflow provides basic process capabilities for managing documents and list items in SharePoint. However, more complex tasks, such as complex routing rules, escalations or managing lists, libraries and sites in SharePoint can be very difficult and in most cases requires a developer to write code to provide the functionality. K2 blackpoint provides all of these capabilities and more out of the box, without the need to write any code. Q: Can't I do all this in SharePoint Designer? A: No, many more complex tasks require a developer to write code to provide the same functionality that is included out of the box in K2 blackpoint. The K2 blackpoint comparison document compares features that are available in SharePoint Designer compared to K2 blackpoint. Q: How does K2 blackpoint scale? A: K2 blackpoint can be scaled to support multiple SharePoint servers. K2 blackpoint does not have to be installed no every SharePoint web front end of the farm, it is server unto itself. They can be clustered on their own dedicated resources, load-balanced, and be a highly available workflow environment. Q: Can I upgrade to K2 blackpearl later? 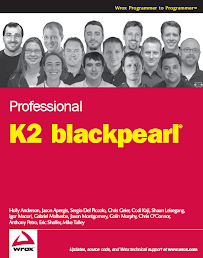 A: Yes, when your workflow needs become more complex over time K2 provides the ability to easily upgrade to K2 blackpearl.